If you've looked at the GoPro Hero4 Black but just can't justify the hefty price tag, then the Edge is a viable alternative. Good build and video quality will appeal to intermediate to advanced users and there's plenty of scope for adjustment. 120fps at 1080p would have been nice but at the price the ISAW Edge is still a bargain. The ISAW Edge is one of a new breed of action cameras taking the best of what has gone before and offering solid design, performance and features for a decent price. Following the now standard action camera 'box' shape, the Edge has a similar look and feel to the GoPro Hero series. This is no surprise as this design has a proven track record, in much the same way as most modern DSLRs also look very similar. To stand out in an ever-growing market, the Edge is packed with high-end features, the headline one being the 4K capture. It also offers 120fps slow motion at 720p resolution, Wi-Fi (and a companion app) and a small live view LCD. Give the price, the Edge has an impressive set of features, and when you start using and handling the camera you realize that ISAW hasn't cut any corners with build and video quality either. It's designed like a GoPro, but the ISAW is a cheap and powerful alternative. The camera is encased within a waterproof housing that enables a maximum dive depth of 40m. The quality of the case is certainly better than some we've seen recently, with good seals on the back door to ensure no moisture enters the enclosure. The compression lever lock provides a solid snap when closed and takes a little effort to re-open, ensuring that an accidental knock won't release the case. Three sealed buttons used to control the camera appear on the exterior of the case and each of these is, again, well designed and works as it should. The two on the front and one on top are surrounded by a raised ridge to avoid accidental knocking of the buttons and each features a firm spring to offer some resistance when pushed. Unlike cases of this design that we've seen from other manufacturers, pushing these buttons produces a positive response from the camera without excessive force, and they can be used easily when wearing gloves. 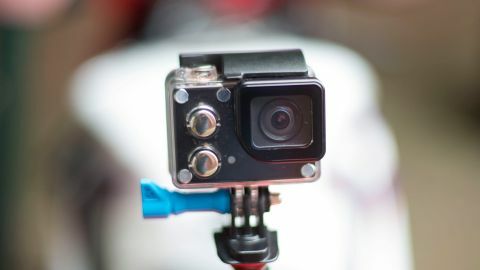 On the base of the case is the standard GoPro mount, which enables this camera to take advantage of the vast array of mounts already on the market. In addition to these mounts ISAW will also be producing a decent range of its own, which will include a Chest Strap, Universal Suction, Head and Surf mount. The ISAW Edge is compatible with GoPro mounts but ISAW will also be producing its own. Released from the housing, the ISAW Edge is a small camera almost identical in size and weight to the GoPro Hero4 black, although the button layout is different. The front features the lens which is a 7 element fixed f/2.5 with 170 degree field of view. On the side are just three ports, one for the MicroSD, one for a USB connection and one for HD. On the base is the battery slot, which holds the small 3.7v 1,000 mAh cell. Images – both video and stills – are captured with impressive clarity by the Sony Exmor 16 million pixel CMOS sensor inside the camera. Looking at the camera, to the left are the setup and mode buttons and on top is the bright orange record button which doubles as the power switch. Camera operation with these three buttons is really quite straightforward; hitting the Mode button toggles you through the video, stills and review modes, while the Setup button takes you into the camera options. Navigating through these options is far easier than it is on the majority of other action cameras of this design, even the GoPro Hero, as the two buttons on the front can be used to navigate up and down, with the shutter button being used to confirm the selection – so there's no carousel style navigation, which is a welcome change. The ISAW Edge is compact and well designed, and it even has a small live view screen on the back. Switching between some options requires you to hold buttons down for a couple of seconds – for example, to turn on Wi-fi you hold down the Mode button. Likewise, in the Settings menu, holding down the Mode button switches through the Video, Photo, My Tune and Settings options. Out in the field, the small LCD on the back proves useful both for composition and checking the settings. It's also a great reference for checking the camera's status and enabling you to quickly see if you're recording, and how much battery life you have left. Video quality is handled automatically by the camera, and this is common with action cameras – but there is an option called MyTune that gives you greater control over the visual quality of the footage you capture. MyTune enables the adjustment of Sharpness, Exposure, Sensitivity, Metering and White balance. All these options will appeal to advanced users who like to fine-tune the quality of the footage that they're capturing. GoPro Heros offer a similar Protune feature, and for many professionals who use action cameras this feature is invaluable – so to see a similar feature here on the Edge is an interesting development, especially at this price point.